Is your Android Phone getting slow? Don’t worry, here we are sharing some tips to make your android phone boost in few minutes. When you buy a new Android phone, it works fine because you get it without any virus, useless file or any other files which may lead your phone slower. But after sometime when you start using your phone without taking care of it, then it starts getting slow. Obviously, it is very irritating when your phone stop responding due to slow performance and you can do nothing except waiting for it to perform normally after hanging. 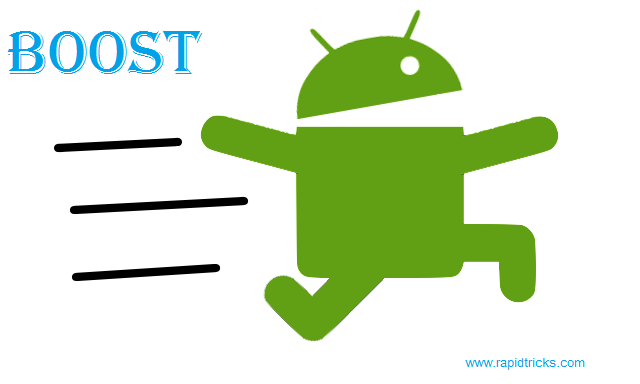 So in this tutorial at Rapidtricks, we are going to share some cool tips to boost android phone speed in few minutes. Every companies phone have a slightly different type of user interface from each other, so here we will prefer Samsung Android phones. Use the tips given below to make your android phones perform fast. Deleting unnecessary files increase your phone’s performance easily, you can delete your phone’s temporary files and useless files which improve your phone’s performance. You can delete your phone’s unnecessary files as by using the simple steps given below. Go to Internal SD card and check which file is not in use, you can delete those files to make your phone’s performance better. Unhide the hidden files, and search for the folder named “thumbnails” and delete it, which will increase the performance and space on your internal SD card. Note: You can only disable internal applications not External, however, you can stop external applications as well. Force Stop the external applications in Application Manager. Clear data of External as well as Internal applications. Move the external applications from internal storage to external storage (option only available for android 4.1 and above). You can easily clear the background applications to increase your phone’s performance instantly. Clear RAM of your phone, it will instantly close all the background process and makes your phone works faster. As we have told you in beginning of the article new phones never hangs because they don’t have Temp files, useless files, external apps etc., so due to free internal storage of new phones, they work fast and without any bugs. That’s why moving files to the external storage make your phone’s performance faster. You can also make a partition from External SD card (Root Needed), we will tell you the process of making a partition from External SD card in a separate article. Extra Tip: If your phone is very slow and fully abound with viruses then you can also hard reset your android phone (Backup your phone data before hard reset) for better performance. Moving the installed applications to your phone’s external SD card can really speed up your phone. Because it will reduce the memory usage in your phone’s Internal SD Card, that will make your phone run smoothly. Moving the apps to your external SD card is very easy and you can do it in just few click. Follow the super simple steps given below to move your Android Application to your external SD card. First of all, navigate to your phone settings and click on it. Now Scroll down and find “Apps” or “Apps manager” tab in the settings of your phone. Here in apps tab, you will find the list of all the installed applications on your phone. Just click on the app (which you want to move) and click on storage, now switch the app storage from Device Memory to SD Card. Applying these tips will surely make your phone’s performance faster without using any application if you know any other way to make Boost Android phone speed without using any application then tell us in the comment box. So go ahead and Apply these tips to your phone Slow Android Phone and share these tips with your friends and let them know about how to Boost Android phone speed without any application. Stay connected with us on social media, and get regular updates of latest tips & tricks in news feed. Like us on Facebook.